The most common site of arthritis in the foot is at the base of the big toe. This joint is called the metatarso-phalangeal, or MTP joint. It’s important because it has to bend every time you take a step. If the joint starts to stiffen, walking can become painful and difficult. In the MTP joint, as in any joint, the ends of the bones are covered by a smooth articular cartilage. If wear-and-tear or injury damage the articular cartilage, the raw bone ends can rub together. A bone spur, or osteophyte, may develop on the top of the bone. This overgrowth can prevent the toe from bending as much as it needs to when you walk. The result is a stiff big toe, or Hallux Rigidus (also referred to as Hallux Limitus). Hallux Rigidus/Limitus usually develops in adults between the ages of 30 and 60 years. No one knows why it appears in some people and not others. It may result from an injury to the toe that damages the articular cartilage or from differences in foot anatomy that increase stress on the joint. Initial treatment should include rest, ice, NSAID’s, and shoe modifications. A stiff- soled shoe to decrease dorsiflexion combined with an enlarged toe box to accommodate swelling may be adequate to relieve symptoms. A rocker-bottom shoe can be prescribed, but this may adversely affect athletic performance and thus be unacceptable. Treatment by a certified therapist including possible use of orthotics may be useful in alleviating pain and improving function of the toe. A corticosteroid injection can provide some relief. However, injections should be used sparingly because they do cause damage to the remaining cartilage surface. This surgery is usually recommended when damage is mild or moderate. It involves removing the bone spurs (also known as osteophytes) as well as a portion of the foot bone, so the toe has more room to bend. The incision is made on the top of the foot. The toe and the operative site may remain swollen for several months after the operation, and you will have to wear a wooden-soled sandal for at least two weeks after the surgery. But most patients do experience long-term pain relief. 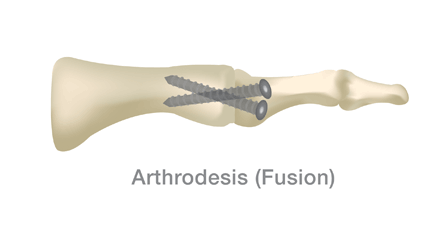 Fusing the bones together (arthrodesis) is often recommended when the damage to the cartilage is severe. 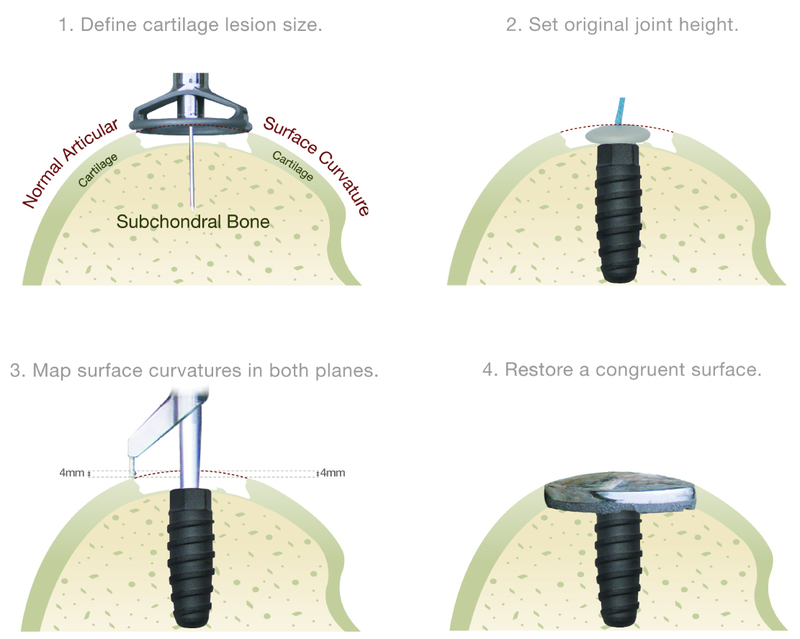 The damaged cartilage is removed and pins, screws, or a plate are used to fix the joint in a permanent position. Gradually, the bones grow together. This type of surgery means that you will not be able to bend the toe at all. For the first six weeks after surgery, you will have to wear a cast and then use crutches for about another six weeks. You typically won’t be able to wear high heels, and you may need to wear a shoe with a rocker-type sole. Older patients who place few functional demands on the feet may be candidates for a hemiarthroplasty. The phalangeal joint surface is removed and an artificial device is implanted. This procedure has been around for over 10 years and is very popular. Common concerns are that the arthritis, and therefore the problem area, is located on the opposite side (metatarsal) of the joint to where the implant is placed. There are also issues with a congruent fit and shortening of the entire joint. Newer techniques that address the metatarsal side of the joint are considered the “next generation” of hemiarthroplasty of the toe. Older patients who place few functional demands on the feet may be candidates for joint replacement surgery. The joint surfaces are removed and an artificial joint is implanted. This procedure may relieve pain and preserve joint motion. however there is extensive bone removal which can make future surgeries more difficult. This procedure combines soft tissue releases with resection of the end of the proximal phalanx (toe bone) and is usually done for less active older individuals, due to the loss of ability to push-off during walking. If you are a middle aged person age 40-70 and have pain in your joints then that is a good starting point for this discussion. As we get older, the pain in our joints becomes more of a nuisance and requires some attention. You may have tried simple things such as physical therapy and injections into your joints but they just aren’t working anymore. You may have even tried a surgical procedure such as an arthroscopy or a microfracture procedure but the pain and ache has returned especially after basic activity such as sports or chasing the kids around. It may be time to investigate a more durable procedure such as the HemiCAP from Arthrosurface. An easy way to describe the HemiCAP implant is to correlate it to a dental procedure. When you have a cavity in your tooth, the dentist places a small filling into the cavity. Your joint cartilage can develop small “cavities” or potholes that need to be addressed as they can cause pain. An orthopaedic surgeon, who is trained on the Arthrosurface system, can perform a minimally invasive surgery that will place a small implant into the defect into that “cavity” or defect which can alleviate your pain and make your cartilage into a smooth surface once again. A family of patient matching cobalt chrome CAP implants. The HemiCAP system precisely aligns the surface of the implant to the contours of the patient’s articular surface, filling the defect and restoring a smooth and continuous joint surface. The implants are designed to match the surface and contours being restored. The instruments and techniques apply to any joint surface, spherical, aspherical, convex, concave or convex-concave. A treatment option that “bridges the gap” between microfracture/injections and total joint replacement. Clinical studies demonstrate positive clinical outcomes across different joints with over 30,000 HemiCAPs implanted globally. Patients report outstanding pain relief, rapid recovery times and significant range of motion improvements in multi-center studies. Procedure may be performed on outpatient basis. The HemiCAP surgical procedure begins when an articular defect is confirmed. The diameter of the defect is determined and a guide wire is introduced into the middle of the defect. The fixation component is implanted to establish the mechanism for anchoring the articular component . Using the fixation component as a central axis, specially designed instruments are used to map the contours of the patient’s articular cartilage surrounding the defect and to prepare the tissue in and around the defect for the resurfacing implant. Once the site is prepared, the HemiCAP resurfacing implant is brought into position and seated.